Outings.ca has lots of fun and interesting places for you to explore, experience, and enjoy all over Southern Ontario. 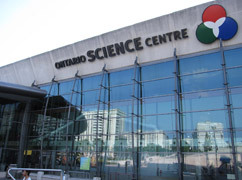 You will be hard pressed to find so much fun and interesting things to do in one place as you will at the Ontario Science Centre. Casa Loma is a beautiful old Castle residency formerly the residence of Sir Henry Pellatt, a prominent Toronto financier, industrialist and military man. Adventure outings consist of outdoor type activities such as hiking, climbing, or exploring. Athletic type outings generally have something to do with sports--playing or experiencing. Cultural outings allow for the exploration of humanity and its works. Dining outings explore not only the culinary arts, but they are experienced in unique environments. Entertainment outings are all about fun and amusement. Relaxing outings are peaceful with beautiful parks or interesting strolls.